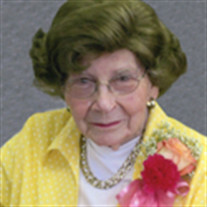 Obituary for Grace VanWerden | Langeland Family Funeral Homes, Inc.
Grace VanWerden, age 102, went to be with her Lord, Friday afternoon March 16, 2018. Grace was born September 17, 1915 in Kalamazoo the daughter of Harry and Anna (Kooi) VanWerden. She had been a lifelong resident in the Kalamazoo area. Grace was employed for 21 years with the Mead Corporation until her retirement in 1978. She was a charter member of Calvary Bible Church, and attended Bethel Baptist Church for several years before returning to Calvary Bible Church. Grace enjoyed spending time with her family, and attending various family functions. She was preceded in death by her brothers and sisters, Joe, Peter, and John VanWerden, Anna Elwell, Harriet Jager, Jennie Dieterman, and Lena Nagel. Grace is survived by several loving nieces and nephews. Friends may meet the family from 10:00-11:00am Friday, March 23 at the Langeland Family Funeral Homes, Memorial Chapel, 622 S. Burdick where services will follow at 11:00am. Interment will follow in Mt. Ever-Rest Cemetery. Memorials may be directed to the Kalamazoo Gospel Mission.